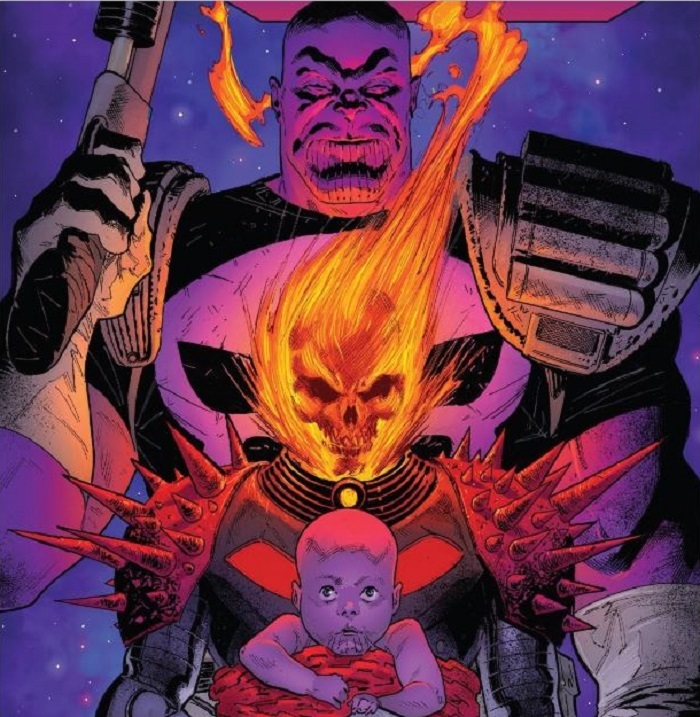 You are here: Home / Comics Guides / What’s Up With Thanos in 2019? What’s Up With Thanos in 2019? For all the talkof the Marvel Cinematic Universe being the tail now wagging Marvel Comics, the publisher is still capable of zigging just when you think they’ll zag into the corporate synergy. Case in point: Thanos is dead. Long live Thanos. Note: Spoilers For Modern Thanos Comics Follow! At the height of last summer’s Avengers: Infinity War sweeping mass culture, making the Mad Titan a household name, Marvel launched a cosmic event saga entitled Infinity Wars (okay, so maybe not 100% immune to congruent branding…). Surprisingly, Thanos is seemingly slain (beheaded- even!) in the opening salvo. Despite the all-too-obvious “low hanging fruit” of placing him at the center of any story pertaining to the gathering of the Infinity Stones, this move is still rather shocking considering Thanos just featured in a very well-received storyline in his own solo series (Thanos Wins by Donny Cates and Geoff Shaw). In this story, Thanos travels to the end of time to literally kill his older self. Although he doesn’t accomplish the goal, upon returning to the present, Thanos vows to avert this particular fate by any means necessary. Guess getting your head cut off is one way of doing it, huh? If this kinda cosmic sci-fi, navel-gazey “need to kill my future self for the sake all of reality” sort of story sounds anything at all like the kind of fare typically affiliated with Thanos’ creator Jim Starlin (think: his Warlock saga), it is not without a heavy dose of irony that Marvel’s plans ran in such direct overlap with Starlin’s own that the writer-artist very publicly announced an abrupt parting of the ways with the publisher. The only real sticking point here being Starlin and artist Alan Davis had been at work on a new trilogy of Thanos graphic novels concurrent (yet unrelated) to the regular monthly ongoing by Cates and company. Only two have been published with the third seemingly now to be filed under “abandoned works” but really only time will tell on that. Back during another time when Jim Starlin wasn’t so into working for Marvel, his most famous properties got packed up and sidelined over the course of a number of years. By the mid-80s, there was a severe lack of cosmic anything until this brash blue space pirate burst onto the pages of Avengers – literally claiming the legacy of Thanos and his starship as her own… by birthright?! Claiming to be the granddaughter of the Mad Titan, Nebula bothered Earth’s Mightiest for a few. However, once Starlin came back onto the scene and re-interjected Thanos into the mix with the 90s Infinity Gauntlet saga, some cold water distancing was thrown on that familial tie. It didn’t help that other writers muddied her identity with other storylines involving multiple Kangs and whatnot. Eventually she got made over into a cyborg and even that got touched up a little bit so that it’s more in keeping with her MCU look. 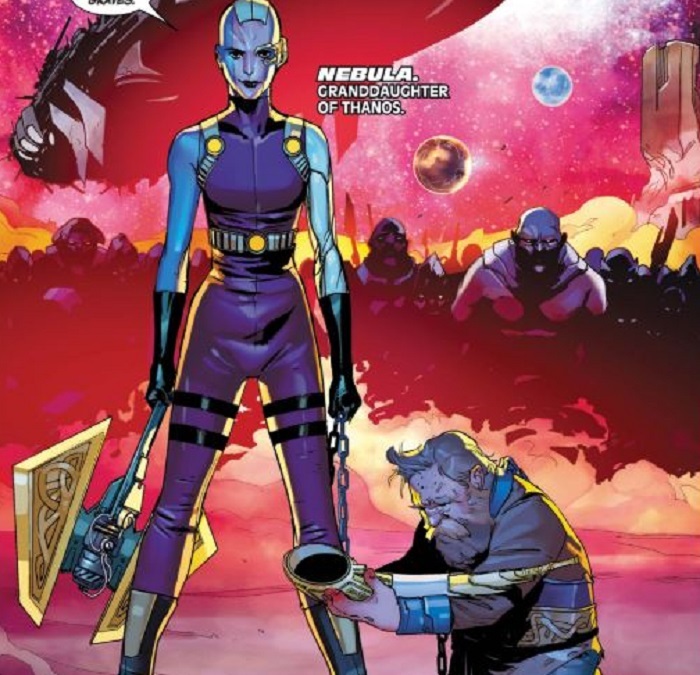 Also borrowing from the movie lore, Nebula is now optionally Thanos’ daughter in the comics (depending on who’s writing). No prizes are still available for how that one reconciles, true believers! In any event, Nebula has most recently been seen giving the Asgardians of the Galaxy a hard time. She is also present at the reading of Thanos’ will, wherein it’s revealed that the Mad Titan will upload his consciousness into a new body and a hunt ensues to get to the most likely candidate, Nebula’s “sister”: Gamora! Even though Thanos has held a lifelong obsession with Death (personified as a woman), he also of late has become involved with a different Goddess of Death (Editor’s Note: In the pages of Thor !). His relationship with his generals has also been recently contentious, seeing them parting ways with the Order working as some kinda glorified gun-for-hire space goon squad. So, the combination of the “side action” now running this pack of spicy loose cannons is certainly not good for the Marvel Universe- particularly if they are able to turn the legacy of Thanos to their own devious ends. In the far distant future of the “Thanos Wins” timeline, Frank Castle (yes, that Frank Castle) is also the spirit of vengeance. He is also a former herald of Galactus. At the end of time, he works for Old King Thanos… until he dies on the job. Offered an afterlife, Castle instead opts to time-travel and plans to kill baby Thanos in his crib. 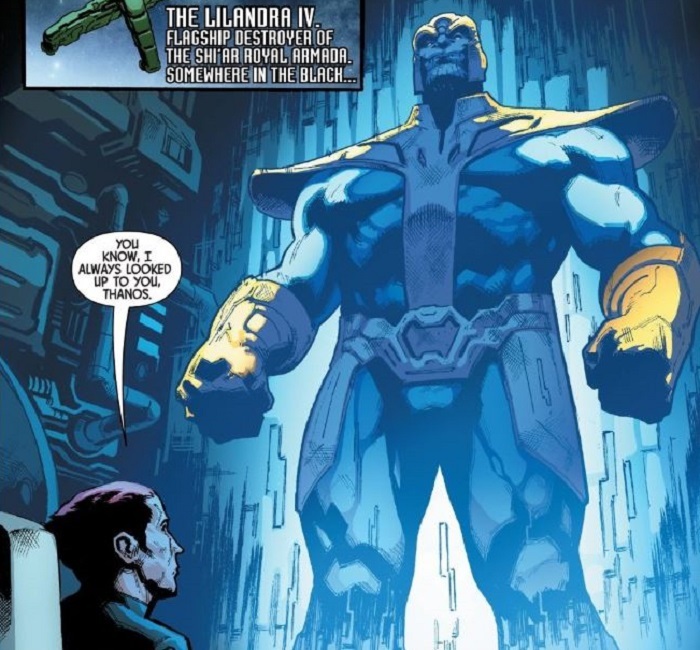 Instead of this, he raises Thanos instead until it all blows up horribly on him and is forced to undo it all (and so as to not contradict Thanos’ origins in other comics). The Rider is currently being featured as a behind-the-scenes retcon fixture in Cosmic Ghost Rider Destroys Marvel History . He is also part of the hunt for Gamora in Guardians of the Galaxy. However as much as he is already the embodiment of Thanos’ legacy, it will be curious to see what Old Man Castle does next. Surprisingly enough, when all of Starlin’s 1970s toys got put back in the box the only one to stay prominent during those aforementioned lean years is Thanos’ brother. In the early ‘80s, Eros joins the Avengers, given the codename “Starfox” and stays with the team until the mystery of Nebula’s ancestry takes him away. However, as society has moved on, it has forced other creators to re-evaluate how Eros’ super power to mentally stimulate the pleasure centers in the brains of others is depicted and ultimately, well, it’s kinda creepy. A very famous story in Dan Slott’s She-Hulk run illustrates the point quite succinctly. Reputation tarnished, of late Eros is changing up the whole poncy spacefop look and is kind of looking to cultivate a bit of a bad boy vibe for himself, conveniently steering into it with all that black for mourning. His makeover is also getting helped along by some new facial scarring, giving him something of a grizzled, battle-damaged Captain Pike from the original TV Star Trek type of look. He is also the default ringmaster of the hunt for Gamora currently unfolding the pages of the most recent volume of Guardians of the Galaxy . Gamora Zen Whoberi Ben Titan. The Most Dangerous Woman in the Galaxy. When Gamora was killed off in the late ‘70s, her soul went on to reside inside one of the Infinity Stones. She reincarnated but something of her stayed behind. Going her own way against the rest of the Guardians, Gamora is determined to utilize the Infinity Stones to get that missing piece back and she doesn’t care who she has to step on or go through to do it. 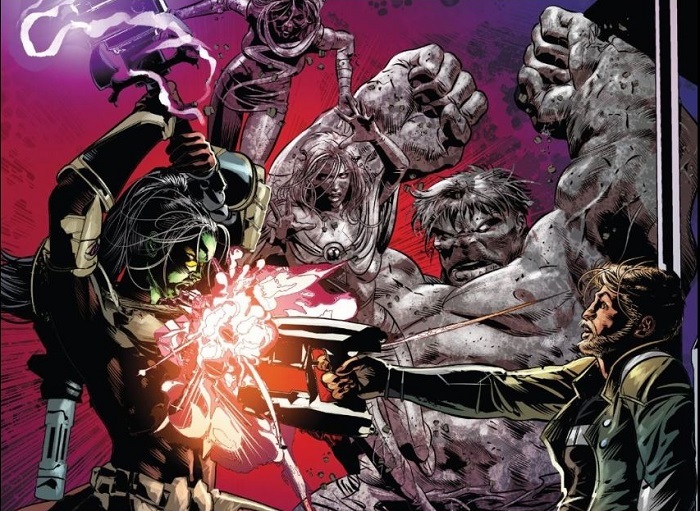 Adopting the hooded, masked identity of “Requiem”, Gamora is the one who beheads Thanos as a pre-emptive strike before the Mad Titan can put his own designs on the Infinity Stones into motion. There’s probably some pent-up revenge in there too, on account of Thanos being a rather harsh adoptive father. More of their relationship is to be detailed in an upcoming “hidden years” Thanos mini series by Tini Howard and Ariel Olivetti, focusing on the era of “Little Girl Gamora”. As mentioned, she is also currently the subject of a hunt for Thanos’ legacy. Regardless of whether or not she in fact becomes the host for the Mad Titan’s reincarnation, her recent heel turn in Infinity Wars has cost her tremendously. It will be interesting to see how much more capable of getting dangerous she is now that she’s getting backed into a proverbial corner.